This book was provided for free by Little Bird Publicity, Lake Union Publishing, and the author in exchange for my honest review. Several months ago, I approached Little Bird Publicity about being included in a campaign for a book that I had read about that sounded like something I would love. Since then, Little Bird Publicity has been gracious enough to include me in their other campaigns, and I have received lots of wonderful books from them as a result. 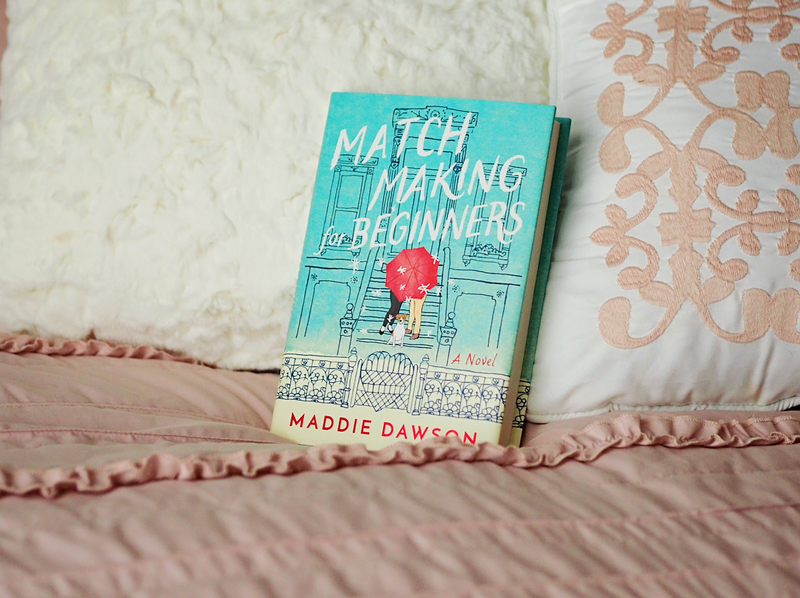 Of all the books they have sent that I have read, so far, Matchmaking for Beginners by Maddie Dawson is my favorite. I have written before about the need I feel sometimes for “brain candy,” but that need goes beyond craving pure enjoyment. Sometimes I crave brain candy books because I need the lightheartedness and positivity that goes along with them. There is depth and beauty to be found in happy books too, and here lately, I have wanted to read almost nothing BUT lighthearted and positive books. When I read the plot of Matchmaking for Beginners, I knew it would fit the bill perfectly. What I didn’t know was just how happy this sweet little book would make me. Matchmaking for Beginners starts off with the story of Blix, an eccentric eighty-something with a tumor she has named Cassandra that she knows will soon end her life and that she keeps a secret from her self-centered family. When she first meets her great-nephew Noah’s fiancée, Marnie, she recognizes her as a kindred spirit and, unbeknownst to Marnie, develops a deep attachment to her. From there, their stories take off in two different directions. Noah almost stands Marnie up at the altar, but he goes through with the wedding only to break up with her on her honeymoon and reveal his plans to teach in Africa for a year. After suffering from a nervous breakdown that results in the loss of her job, Marnie moves back home to Florida where her sister’s “perfect” life is a constant reminder that Marnie needs to find her own “perfect” husband and settle into a typical life. Meanwhile, Blix returns to her Brooklyn brownstone where she works her magic, both figurative and literal, on those she loves. When her life ends, the “big life” she envisioned for Marnie begins, and Marnie travels to New York to deal with the inheritance of Blix’s brownstone…and to maybe spread a little magic of her own and figure out what she REALLY wants from life in the process. This little book is like a little piece of magic of its own, and I couldn’t help but consider it a bit of a modern-day fairy tale, as I read. Maddie Dawson has created a fantastic cast of characters and sprinkled a bit of magical realism throughout the pages of this adorable little book. Blix is as eccentric as they come, and her kindness and ability to spread joy and magic to people around her made her the grandmother I always wanted. The residents of the brownstone she owns are just as delightful, and getting to know their backgrounds and personalities throughout the book was a treat. Patrick, the reclusive man with burn scars, is mysterious but funny and caring, Jessica and Sammy and a super cute mother-son duo, and Lola is the perfect stubborn (but devoted) best friend for Blix. As for Marnie, she is perfectly flawed. Her response to her breakup from Noah is raw and realistic, and although I wanted to grab her at times and shake her and tell her to get over the jerk during her time in California before moving back home, I think that the depression and irrational behaviors she exhibits are understandable after being dumped on her honeymoon and divorced shortly after. Marnie doesn’t immediately embrace the plan that Blix has for her, and the lessons she learns throughout the book are not easy for her. This isn’t a story where one major event happens that sheds light on everything wrong in her life, she has some major epiphany, and then she lives happily ever after. She makes some really stupid choices at times, and I didn’t agree with some of those choices at all…but the beauty of the story is that Blix was able to see straight through to Marnie’s heart and knew that she would find her way to the “big life” that Blix envisioned for her. Not only are the characters in Matchmaking for Beginners a joy, but the writing itself is the exact kind of lyrical prose that never fails to draw me in and keep me hooked from the very first page. Dawson’s style flows well, and the internal dialogue Blix and Marnie have during their respective chapters never feels forced. The writing is heartwarming and sweet without being cliché, and I see many more Maddie Dawson books in my future. If you are looking for an excellent read that is lighthearted and fun without being void of meaning or too sugary sweet, Matchmaking for Beginners is the perfect choice. Posted in Fiction, Women's FictionTagged book review, fiction review, Lake Union Publishing, Little Bird Publicity, Maddie Dawson, Matchmaking for Beginners, Women's Fiction, women's fiction reviewBookmark the permalink.